Having a roof leak can cause lots of damage to the inside of your home. In fact, a small roof leak can cause thousands of dollars in damage to your home. Water entering the home from a roof leak can cause damage to ceilings and walls and also damage items on the inside of the home as well. Furniture and electronics can be damaged by the roof leak if they are beneath the roof leak. That’s why when there is a problem with your home’s roof it’s important to get it repaired as quickly as possible. 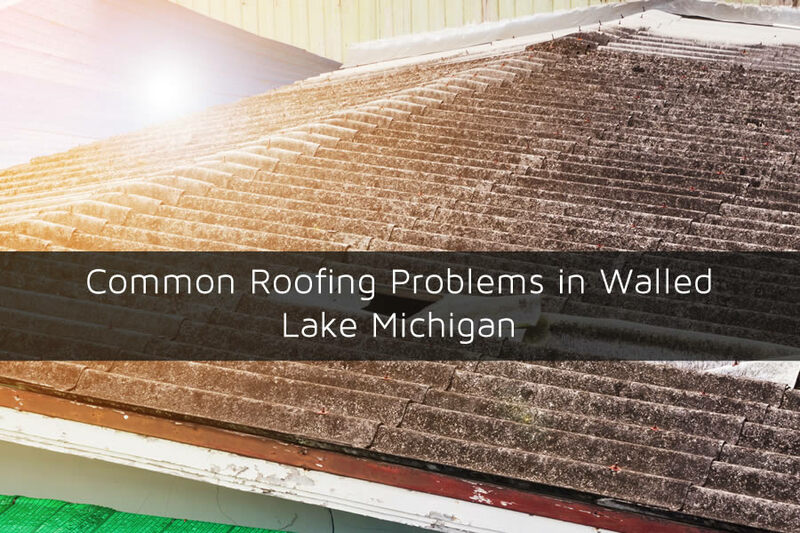 In this article I’ll list some of the common roof problems your home may have in the Walled Lake Michigan area. If you notice any sort of problem on your home’s roof it’s important to get it repaired as quickly as possible. Sometimes roof leaks can develop over time which is why an annual roofing inspection helps so much. A roofing inspection done on your home can help to locate potential problems with the roof so that roof repairs can be done before any damage occurs to the inside of the home. Although a roof inspection can help to prevent some of the problems on the roof there are times when roof damage occurs quickly as when a storm damages the roof. Storms pose a threat to roofing surfaces especially for older roofs. As the roofing materials get older they become more brittle and break more easily. They also don’t adhere to the roofing beneath them which can be a problem if there are high winds in the storm. Wind can get under the shingles and blow them up which breaks them. After they break they will allow the underlayment of the roof to be exposed which almost always end up as a roof leak eventually. Storms can also damage the roof if there is hail present in the storms. Falling hail and damage individual shingles and cause holes to form in them. These holes allow water to pass through and get beneath the shingles. Hail damaged shingles are harder to detect from the ground but almost always end up as a roof leak. If you home has impact resistant shingles, this hail damage may not occur as these shingles are specifically designed to prevent hail damage to the roofing surface. During the winter as the temperature drops there is another threat to your home’s roof and that is an ice dam forming on your home. As water starts to fall down the roof into the gutter it can sometimes freeze. Once this frozen block of ice gets large enough it blocks water from leaving the roof of the home on a small scale. Then as the water under the ice starts to flow in or the bottom of the ice melts the only place it has to go is inside your home. This is known as a roof ice dam and can damage your roof and exterior walls if you do not have roof ice dam protection in place. Although the roofing surface is certainly the highlight of the roof many times there are problems that occur in the roof components. Things such as plumbing pipes or skylights can be sealed against the roofing surface and start to leak. Usually the seal on these items are comprised on rubber or tar to better seal but can crack and start to leak. Skylights and chimneys are two of the more susceptible problem areas since they are exposed to high temperature changes. If storms and ice is enough to worry about there is another common cause for roof leaks and that is wildlife and trees around the home. Branches that break out of trees can impact the roof and cause a leak. Also as branches of a tree scrub the roof it can damage the shingles resulting in a roof leak. Finally, there can be wildlife such as squirrels or raccoons that damage areas on the roof scurrying about.